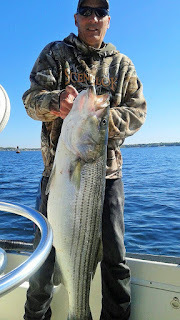 Mike Swain with one of the many striped bass he has caught in the Conimicut Light area this year. 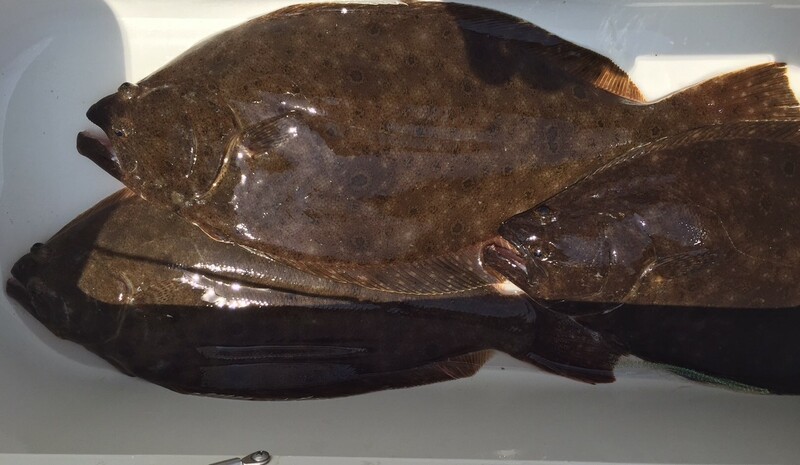 Fish in the box: Paul Bertelli took brother-in-law Jim Pontarelli and nephew Will (both of Narragansett) fishing this weekend and hooked them up with these summer flounder off Matunuck. Matthew Garstka of Central Falls weighed in this 13.44 pound fluke caught off Block Island at Quaker Lane Bait & Tackle. What time do you fish? Where are you fishing this this week? Are you leaving the dock at 5:00 a.m. or 6:00 a.m.? 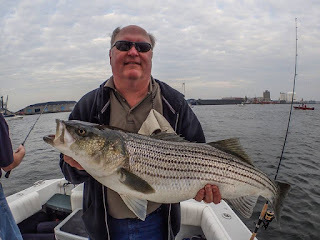 These are the questions Mike Swain of Coventry hears often as angler acquaintances try to figure out what he is doing right to catch such large striped bass, summer flounder and other species. Mike works at Electric Boat, Quonset Point, but fishing is his passion. It is in his genes. His Dad fished commercially and recreationally for years and he learned a lot from him. To catch fish consistently in Narragansett Bay and along coastal shores, you have to learn from your experiences, the patterns fish have followed over the years and start to think like a fish. Mike Swain has done this. To think like a fish you have to consider a lot of variables including the forage fish stripers eat. What brings the type of food striped bass eat (and the striped bass) to a particular spot includes variables such as the spawning season of forage fish, water temperature and depth, current and tide and time of day. Mike combines these factors with his historical fishing experiences to think like a fish. He shows up waiting for the striped bass with the type of bait or food they are eating. Mike then puts in the time to catch fish. “We fished all day for two fish.” said Mike as we talked about striped bass fishing in the upper Bay a couple of weeks ago. The fish caught were in the high twenty pound range, which for some are lifetime trophy fish and/or their personal best. 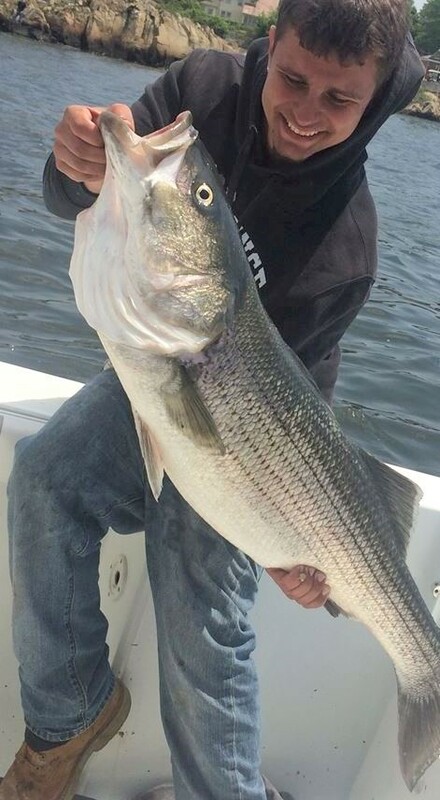 Mike and his fishing partner Jay Anctil (also of Coventry) have caught dozens of striped bass many in the 15, 20 and 30 pound range this season with one of his largest being caught last week topping 36 pounds. These are large fish for the Bay and he has caught fish like this year after year. Two years ago I had the privilege of fishing with Mike. We fished on his boat his way… with the freshest bait possible, moving from place to place fishing where the bass have appeared in the past… trying to think like a fish and being patient waiting for them to bite. Atlantic menhaden, either live lining them or fishing with cut-up chunks, is his bait of choice this time of year for striped bass. This Saturday Mike called me while on the water, “Hey Dave I am fishing just north of you (in the East passage) and can’t revive a fish. He came to the boat and we chatted. He and his fishing partner Jay had caught two fish in the 25 to 30 pound range. Mike has a nose for bass, a nose for fish in general. Once the bass fishing slows in the upper Bay he moves to the mid and lower Bay fishing favorite spots around Prudence Island, Hope Island and Jamestown. 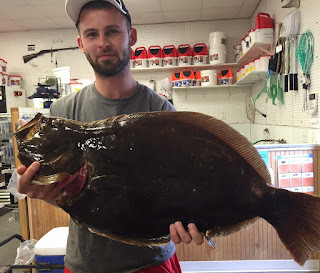 He then puts his summer flounder (fluke) game face on and finds them wherever they are including Warwick, North Kingstown, Jamestown, Newport, Narragansett and more. “You just have to put the time in.” said Mike. And yes, think like a fish to find and catch striped bass and other fish consistently. 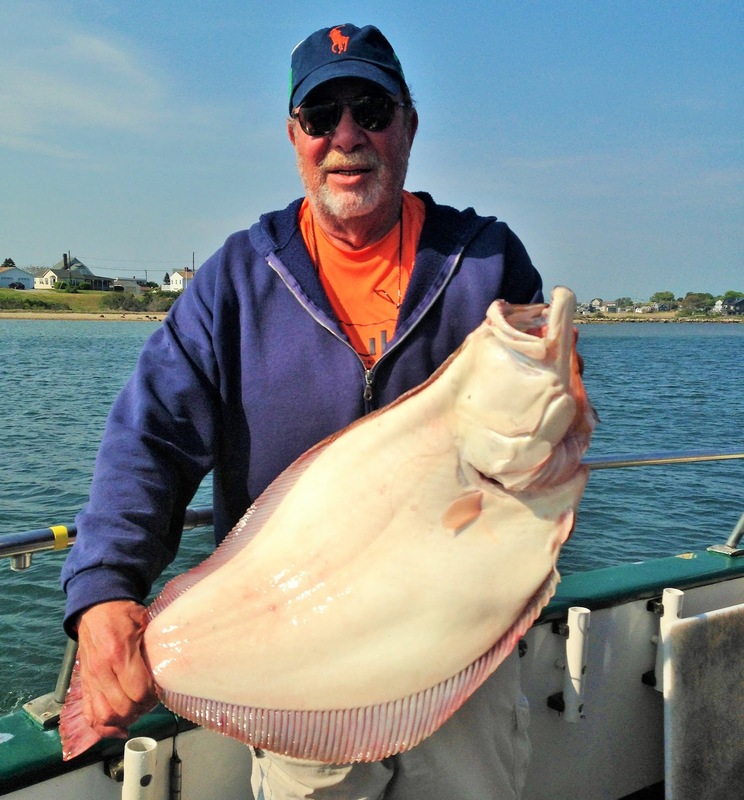 Barry Gootkind of Narragansett with the 11.1 pound summer flounder he caught on the Seven B’s last Friday. Brandon Hagopian caught this 43 pound, 47” striped bass this week as fishing intensified in the upper Bay. Ken Blanchard and family fished the Providence River with Capt. Jack Sprengel of East Coast Charters and landed this bass on a live pogie last week. 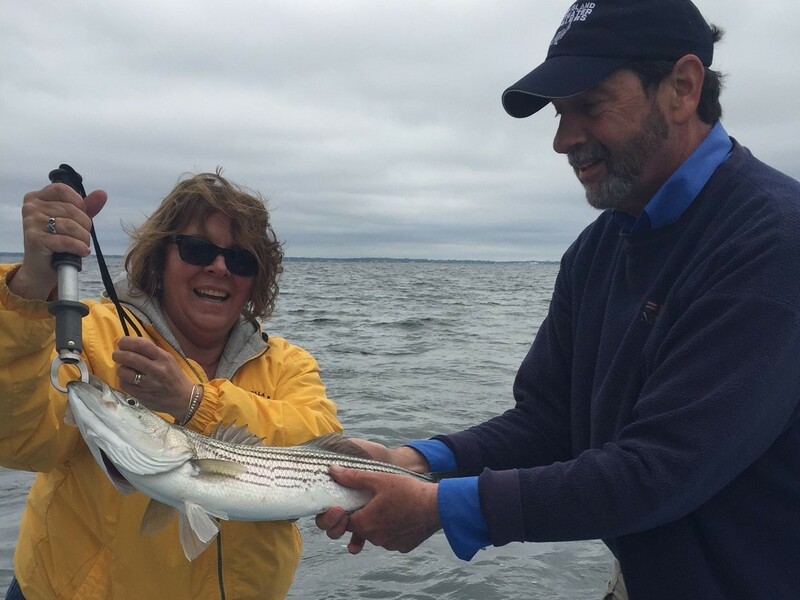 Dawn McWilliams of Ithaca, NY caught her first Narragansett Bay striped bass last week, shown with Capt. Dave Monti. The RI Lions Sight Foundation (RILSF) will be hosting their 9th Annual Fishing Tournament for Visually Impaired Persons (VIPs) on June 26th aboard the Frances Fleet party boat in Galilee, RI. The half-day tournament is free to the VIP’s and their guides and includes gifts, breakfast and the half-day of fishing from 8:00 a.m. to noon. The fishing tournament will be followed by lunch and an awards ceremony at the Hanks’ Down South restaurant. The three top winners will be eligible to represent Rhode Island at the Lions National VIP Fishing Tournament held on the Outerbanks of North Carolina. There are over 2,500 visually impaired persons in Rhode Island so organizers are urging readers to please pass along information on this opportunity. For information and forms visit http://www.lions4sight.org/fish.htm or call Ken Barthelemy at 401.529.6173. Live lining or fishing with chunks of Atlantic menhaden, day or night, has been the bait of choice for striped bass. One of the largest fish this week was caught by Brandon Hagopian which was a 43 pound, 47” striped bass. On Saturday, June 4th, 9:00 a.m. to 3:30 p.m. the Fly Fishing Express take anglers to fish on Aquidneck Island. The train will leave from 710 Anthony Road, Portsmouth and head toward Newport stopping at hard to get to places to fish. The train stops for lunch and then more fly fishing in the afternoon. The cost is $15. Register with Kim Sullivan at 401-539-0037 or email her at Kimberly.sullivan@dem.ri.gov. This season’s 30th Annual Salt Water Sportsman National Seminar Series in New England will be held in Taunton, Massachusetts. The Seminar Series brings decades of experience and expertise to eight of the most active and engaged fishing communities in the country and this year the Taunton area will be one of them. As the nation’s longest-running educational program on recreational marine fishing tactics, the series covers the how-tos and where-tos of catching gamefish. Every seminar is hosted by George Poveromo, host of “World of Saltwater Fishing” on NBC Sports, with the help of local fishing experts and captains. Each seminar is five hours and covers a variety of tailored topics relevant to the regional fishing environment, including weather conditions, controlled-depth fishing, tools and technology, and the effects of tides and temperature on fish. The series employs a team-teaching concept, where four experts take the stage for each session. The first seminar is scheduled for January 7 in Fort Myers, Florida and the session in our region is scheduled for March 4 in Tauton, Massachusetts. Striped bass fishing remains strong in the Bay with fish getting larger. Bass bite is starting on Block Island and fish continue to be landed along the southern coastal shore. See above column. Squid fishing last week was slow with dirty water but reports over the weekend were expected to improve and they did as the water cleared and warmed up a bit. I fished the Frances Fleet for squid with the RI Saltwater Anglers group Saturday night and caught about 12 squid which was about the average on the boat with some angler catching a lot more and some less.